I'm closing in on the 3 week mark before the new baby arrives. In spite of my enormous belly, I still feel like a long-legged stork will in fact drop the little parcel wrapped in pink or blue cloth on the doorstep and be gone in the blink of an eye. But I know that isn't the case, especially with the lack of appetite I've had lately. Even though I haven't felt a whole lot like eating - or at least eating very much at one sitting - I have felt like reading about food. It's probably the first time in years that I've been current on my feedly blog stream. I have a record number of books on my shelves from the library, and I even had the time to read a book for review from cover to cover: Deliciously Holistic by Shelly Alexander, CHFS. What attracted me to this book was the description, "There is a simple, easy-to-follow recipe for eating healthy, delicious foods that can also lead you on an enjoyable path to vibrant health." I was particularly interested in this claim because I read a lot on whole food diets and I know first hand just how confusing all of it can be. Keeping all of the linguistics of whole food eating can be daunting as well, and just where should a person new to the idea of a whole foods diet start? I found this book to be a very good resource for someone just starting out in holistic eating. It gives a broad overview of healthy diet without subscribing to just one diet trend (vegan, paleo, primal, vegetarian), but includes simple, tasty recipes for those who might already follow any one of those diets. It also confirms a lot of information I've already gained from reading about and following a mostly holistic diet for some time. It's been a good 3 years since I ditched my microwave, gave up boxed cereal, and in general started taking more hands on control of my own diet. That also directly translated to the diets of my immediate family so much as I can help it. I try not to be militant, but also aim for consistency. Most food in my house is slow food. I take genuine pleasure in adding new kitchen processes that are (hopefully) healthier than packaged or more convenient counterparts. I've become a real bread baker, all my beans are soaked and cooked from dried, and I try to focus on purchasing raw materials and then making the most of them as the mood strikes me. This means thinking ahead a good part of the time, and in the cases where I haven't thought ahead, it causes me to be creative in coming up with nutritious meals for my family. It definitely helps to be consistently reading real food blogs and cookbooks, and like I said, Deliciously Holistic would be an excellent first step resource for someone completely new to the lifestyle changes that whole food diets require. 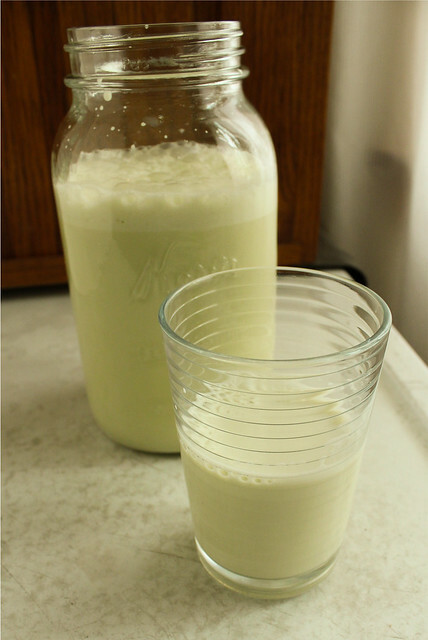 For those unfamiliar with making homemade, alternative milks, there are a number of creative non-dairy drinks, plenty of flavor combinations I've never seen or considered before like Carrot Pecan Milk or Nectarine Walnut Milk. 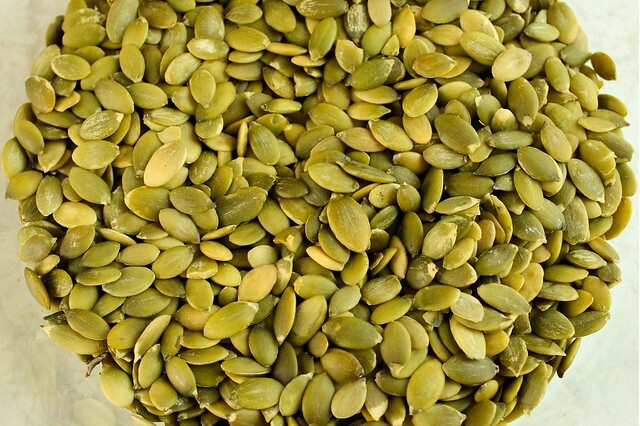 The recipe for Orange Ginger Pumpkin Seed Milk sounded particularly good to me, and it surely did not disappoint. It was a refreshing change from ordinary homemade almond or coconut milks, and had a truly nourishing taste to it that just felt comforting to drink. As Alexander explains, nuts and seeds are usually best soaked or sprouted because it breaks down their enzyme inhibitors. I've gotten rather used to soaking and sprouting, and a bit of planning ahead doesn't bother me at all. 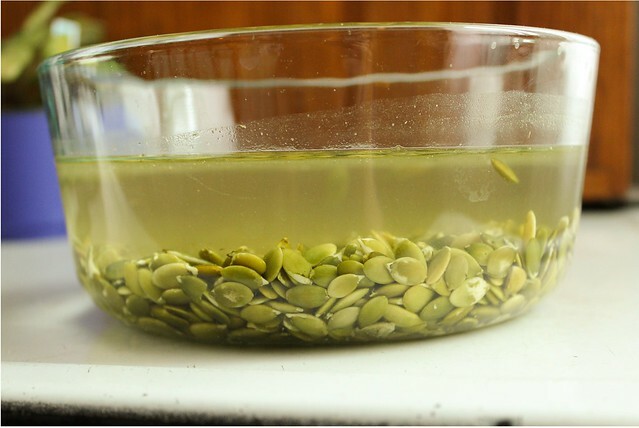 For this recipe, you'll need to soak the pumpkin seeds in filtered or spring water for 4-6 hours before continuing. Be sure to use an organic orange for the juice and zest, non-organic are often waxed and artificially colored. 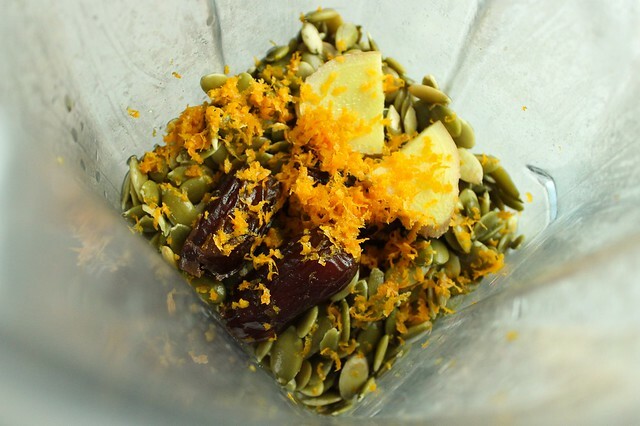 Blend all the ingredients in a blender until creamy and smooth. Taste and add more sweetener to your preference. Strain with a nut milk bag, or other fine strainer (a homemade bag made of unbleached muslin will also work just fine). Milk will last 3-5 days in the refrigerator. I have a high-speed Vitamix blender, so I don't have to be too careful about chopping up things like ginger and dates, but you may have to take more care with a regular blender. The finished drink is the palest green and has a very unique flavor. It's definitely a recipe I'll make again, and I'm excited to try many of the other alternative milks in Deliciously Holistic this summer as well! Disclaimer: I received a copy of Deliciously Holistic for review. As always, all opinions are my own! You can find a copy of the book for sale on Amazon, or through Shelly's website where you can also find more recipes and whole food information.